For other uses, see Noah's Ark (disambiguation). 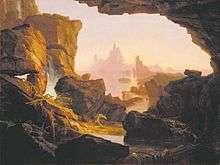 Noah's Ark (1846), a painting by the American folk painter Edward Hicks. Noah's Ark (Hebrew: תיבת נח‎‎; Biblical Hebrew: Tevat Noaḥ) is the vessel in the Genesis flood narrative (Genesis chapters 6–9) by which God spares Noah, his family, and a remnant of all the world's animals from the flood. According to Genesis, God gave Noah instructions for building the ark. Seven days before the deluge, God told Noah to enter the ark with his household and the animals. The story goes on to describe the ark being afloat for 150 days and then coming to rest on the Mountains of Ararat and the subsequent receding of the waters. The story is repeated, with variations, in the Quran, where the ark appears as Safina Nuh (Arabic: سفينة نوح‎‎ "Noah's boat"). The Genesis flood narrative is similar to numerous other flood myths from a variety of cultures. The earliest known written flood myth is the Sumerian flood myth found in the Epic of Ziusudra. Searches for Noah's Ark have been made from at least the time of Eusebius (c.275–339 CE) to the present day. There is no scientific evidence for a global flood, and despite many expeditions, no evidence of the ark has been found. The challenges associated with housing all living animal types, and even plants, would have made building the ark a practical impossibility. Noah is warned of the coming flood and told to construct the ark. God spells out to Noah the dimensions of the vessel: 300 cubits in length, 50 cubits in width and 30 cubits in height (450 × 75 × 45 ft or 137 × 22.9 × 13.7 m). It had three internal divisions (which are not actually called "decks", although presumably this is what is intended), a door in the side, and a sohar, which may be either a roof or a skylight. It is made of "gopher" wood, a word which does not appear elsewhere in the entire Bible, and is divided into qinnim, a word which always refers to birds' nests elsewhere, leading some scholars to amend this to qanim (reeds), the material used for the boat of Atrahasis, the Babylonian flood-hero. God instructs Noah to kapar (smear) the ark with koper (pitch): in Hebrew the first of these words is a verb formed from the second and, like "gopher", it is a word found nowhere else in the Bible. Noah is instructed to take on board his wife, his three sons, and his sons' wives. He is also to take two of every living thing, and seven pairs of every clean creature and of every bird, together with sufficient food. The story of the flood closely parallels the story of the creation: a cycle of creation, un-creation, and re-creation, in which the ark plays a pivotal role. The universe as conceived by the ancient Hebrews comprised a flat disk-shaped habitable earth with the heavens above and Sheol, the underworld of the dead, below. These three were surrounded by a watery "ocean" of chaos, protected by the firmament, a transparent but solid dome resting on the mountains which ringed the earth. Noah's three-deck ark represents this three-level Hebrew cosmos in miniature: the heavens, the earth, and the waters beneath. In Genesis 1, God created the three-level world as a space in the midst of the waters for humanity; in Genesis 6–8 (the flood story) he fills that space with waters again, saving only Noah, his family and the animals with him in the ark. There is a consensus among scholars that the Pentateuch (the first five books of the Bible, beginning with Genesis) was the product of a long and complex process that was not completed until after the Babylonian exile. For well over a century scholars have recognised that the Bible's story of Noah's ark is based on older Mesopotamian models. Because all these flood stories deal with events that allegedly happened at the dawn of history, they give the impression that the myths themselves must come from very primitive origins. But in fact, the myth of the global flood that destroys all life only begins to appear in the Old Babylonian period (20th–16th centuries BCE). The reasons for this emergence of the typical Mesopotamian flood myth may have been bound up with the specific circumstances of the end of the Third Dynasty of Ur around 2004 BCE and the restoration of order by the First Dynasty of Isin. Probably the most famous version is contained in a longer work called the Epic of Gilgamesh, now known only from a 1st millennium Assyrian copy in which the flood hero is named Utnapishtim, "He-found-life". (Gilgamesh is the hero of the complete epic, not the flood story hero). The last known version of the Mesopotamian flood story was written in Greek in the 3rd century BCE by a Babylonian priest named Berossus. From the fragments that survive, it seems little changed from the versions of two thousand years before. The version closest to the Biblical story of Noah, and very probably the primary source for it, is that of Utnapishtim in the Epic of Gilgamesh. The most complete text of Utnapishtim's story is a clay tablet dating from the 7th century BCE, but fragments have been found from as far back as the 19th century. The parallels – both similarities and differences – between Noah's Ark and the boat of the Babylonian flood-hero Atrahasis have often been noted. Noah's ark is rectangular, while Atrahasis was instructed to build his in the form of a cube; Atrahasis's ark has seven decks with nine compartments on each level, while Noah's has three decks, but he is not given any instructions on the number of compartments to build. The word used for "pitch" (sealing tar or resin) is not the normal Hebrew word, but is closely related to the word used in the Babylonian story. The causes for God/gods having sent the flood also differ. In the Hebrew narrative the flood comes as God's judgment on a wicked humanity. In the Babylonian Epic of Gilgamesh the reasons are not given and the flood appears to be the result of the caprice of the gods. In the Atrahasis version of the Babylonian flood story, the flood was sent by the gods to reduce human over-population, and after the flood, other measures were introduced to prevent the problem recurring. Talmudic tractates Sanhedrin, Avodah Zarah and Zevahim relate that, while Noah was building the ark, he attempted to warn his neighbors of the coming deluge, but was ignored or mocked. In order to protect Noah and his family, God placed lions and other ferocious animals to guard them from the wicked who tried to stop them from entering the ark. According to one Midrash, it was God, or the angels, who gathered the animals to the ark, together with their food. As there had been no need to distinguish between clean and unclean animals before this time, the clean animals made themselves known by kneeling before Noah as they entered the ark. A differing opinion said that the ark itself distinguished clean animals from unclean, admitting seven pairs each of the former and one pair each of the latter. According to Sanhedrin 108B, Noah was engaged both day and night in feeding and caring for the animals, and did not sleep for the entire year aboard the ark. The animals were the best of their species, and so behaved with utmost goodness. They abstained from procreation, so that the number of creatures that disembarked was exactly equal to the number that embarked. The raven created problems, refusing to leave the ark when Noah sent it forth and accusing the patriarch of wishing to destroy its race, but as the commentators pointed out, God wished to save the raven, for its descendants were destined to feed the prophet Elijah. According to one tradition, refuse was stored on the lowest of the ark's three decks, humans and clean beasts on the second, and the unclean animals and birds on the top; a differing interpretation described the refuse as being stored on the utmost deck, from where it was shoveled into the sea through a trapdoor. Precious stones, said to be as bright as the noon sun, provided light, and God ensured that food remained fresh. Some more unorthodox interpretations of the ark narrative also surfaced: the 12th-century Jewish commentator Abraham ibn Ezra interpreted the ark as being a vessel that remained underwater for 40 days, after which it floated to the surface. St. Hippolytus of Rome (died 235) sought to demonstrate that "the Ark was a symbol of the Christ who was expected", stating that the vessel had its door on the east side – the direction from which Christ would appear at the Second Coming – and that the bones of Adam were brought aboard, together with gold, frankincense, and myrrh (the symbols of the Nativity of Christ). Hippolytus furthermore stated that the ark floated to and fro in the four directions on the waters, making the sign of the cross, before eventually landing on Mount Kardu "in the east, in the land of the sons of Raban, and the Orientals call it Mount Godash; the Armenians call it Ararat". On a more practical plane, Hippolytus explained that the lowest of the three decks was for wild beasts, the middle for birds and domestic animals, and the top level for humans. He says that male animals were separated from the females by sharp stakes so that there would be no breeding on board. The early Church Father and theologian Origen (c. 182–251), in response to a critic who doubted that the ark could contain all the animals in the world, argued that Moses, the traditional author of the book of Genesis, had been brought up in Egypt and would therefore have used the larger Egyptian cubit. He also fixed the shape of the ark as a truncated pyramid, square at its base, and tapering to a square peak one cubit on a side; it was not until the 12th century that it came to be thought of as a rectangular box with a sloping roof. 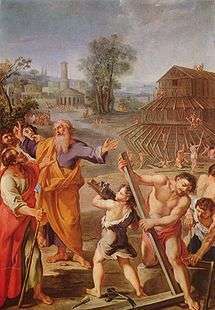 Early Christian artists depicted Noah standing in a small box on the waves, symbolizing God saving the Christian Church in its turbulent early years. St. Augustine of Hippo (354–430), in his work City of God, demonstrated that the dimensions of the ark corresponded to the dimensions of the human body, which according to Christian doctrine is the body of Christ and in turn the body of the Church. St. Jerome (c. 347–420) identified the raven, which was sent forth and did not return, as the "foul bird of wickedness" expelled by baptism; more enduringly, the dove and olive branch came to symbolize the Holy Spirit and the hope of salvation and eventually, peace. The olive branch remains a secular and religious symbol of peace today. Ussher's chronology, one of the most prominent attempts to date events according to the Bible, calculated that Noah would have lived from 2948 until 1998 BCE, with the deluge occurring in 2349 BCE. Calculations based on figures in the Hebrew Bible place the flood in 1656 AM (Anno Mundi); those based on the Greek LXX Bible in 2262 AM; and those based on the Samaritan Pentateuch, in 1308 AM. The Book of Jubilees, by a different calculation, also yields the date 1308 AM for the flood. In contrast to the Jewish tradition, which uses a term that can be translated as a "box" or "chest" to describe the Ark, surah 29:15 of the Quran refers to it as a safina, an ordinary ship, and surah 54:13 describes the ark as "a thing of boards and nails". Abd Allah ibn Abbas, a contemporary of Muhammad, wrote that Noah was in doubt as to what shape to make the ark, and that Allah revealed to him that it was to be shaped like a bird's belly and fashioned of teak wood. Abdallah ibn 'Umar al-Baidawi, writing in the 13th century, explains that in the first of its three levels wild and domesticated animals were lodged, in the second the human beings, and in the third the birds. On every plank was the name of a prophet. Three missing planks, symbolizing three prophets, were brought from Egypt by Og, son of Anak, the only one of the giants permitted to survive the Flood. The body of Adam was carried in the middle to divide the men from the women. Surah 11:41 says: "And he said, 'Ride ye in it; in the Name of Allah it moves and stays! '"; this was taken to mean that Noah said, "In the Name of Allah!" when he wished the ark to move, and the same when he wished it to stand still. Noah spent five or six months aboard the ark, at the end of which he sent out a raven. But the raven stopped to feast on carrion, and so Noah cursed it and sent out the dove, which has been known ever since as the friend of humanity. The medieval scholar Abu al-Hasan Ali ibn al-Husayn Masudi (died 956) wrote that Allah commanded the Earth to absorb the water, and certain portions which were slow in obeying received salt water in punishment and so became dry and arid. The water which was not absorbed formed the seas, so that the waters of the flood still exist. 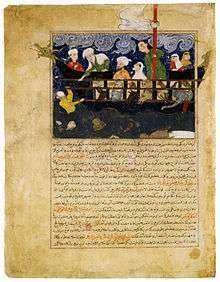 Masudi says that the ark began its voyage at Kufa in central Iraq and sailed to Mecca, circling the Kaaba before finally traveling to Mount Judi, which surah 11:44 states was its final resting place. This mountain is identified by tradition with a hill near the town of Jazirat ibn Umar on the east bank of the Tigris in the province of Mosul in northern Iraq, and Masudi says that the spot could be seen in his time. The Bahá'í Faith regards the Ark and the Flood as symbolic. In Bahá'í belief, only Noah's followers were spiritually alive, preserved in the "ark" of his teachings, as others were spiritually dead. The Bahá'í scripture Kitáb-i-Íqán endorses the Islamic belief that Noah had numerous companions on the ark, either 40 or 72, as well as his family, and that he taught for 950 (symbolic) years before the flood. The Bahá'í Faith was founded in 19th century Persia, and it recognizes divine messengers from both the Abrahamic and the Indian traditions. The practical challenges associated with building an ark large enough to house all living animal types, and even plants, would have been very considerable. Various editions of the Encyclopædia Britannica reflect the collapse of belief in the historicity of the ark in the face of advancing scientific knowledge. Its 1771 edition offered the following as scientific evidence for the ark's size and capacity: "...Buteo and Kircher have proved geometrically, that, taking the common cubit as a foot and a half, the ark was abundantly sufficient for all the animals supposed to be lodged in it ... the number of species of animals will be found much less than is generally imagined, not amounting to a hundred species of quadrupeds". 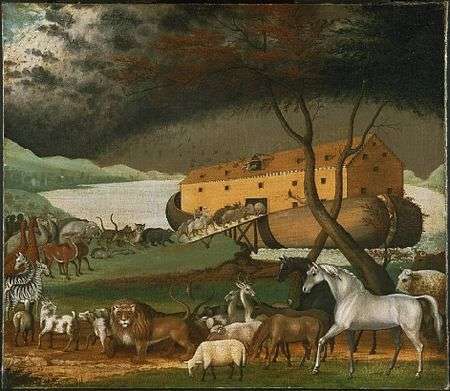 By the eighth edition (1853–60), the encyclopedia said of the Noah story, "The insuperable difficulties connected with the belief that all other existing species of animals were provided for in the ark are obviated by adopting the suggestion of Bishop Stillingfleet, approved by Matthew Poole ... and others, that the Deluge did not extend beyond the region of the Earth then inhabited". By the ninth edition, in 1875, no attempt was made to reconcile the Noah story with scientific fact, and it was presented without comment. In the 1960 edition, the article on the ark stated that "Before the days of 'higher criticism' and the rise of the modern scientific views as to the origin of the species, there was much discussion among the learned, and many ingenious and curious theories were advanced, as to the number of animals on the ark". In Europe, the Renaissance saw much speculation on the nature of the ark that might have seemed familiar to early theologians such as Origen and Augustine. At the same time, however, a new class of scholarship arose, one which, while never questioning the literal truth of the Ark story, began to speculate on the practical workings of Noah's ark from within a purely naturalistic framework. In the 15th century, Alfonso Tostada gave a detailed account of the logistics of the ark, down to arrangements for the disposal of dung and the circulation of fresh air. The 16th-century geometrician Johannes Buteo calculated the ark's internal dimensions, allowing room for Noah's grinding mills and smokeless ovens, a model widely adopted by other commentators. 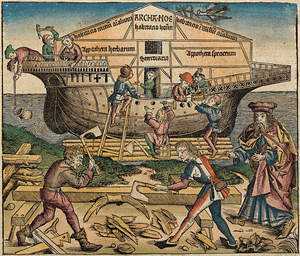 Searches for Noah's Ark have been made from at least the time of Eusebius (c.275–339 CE) to the present day. Various locations for the ark have been suggested but have never been confirmed. The practice is widely regarded as pseudoarchaeology. Search sites have included Durupınar site, a site on Mount Tendürek in eastern Turkey and Mount Ararat, but geological investigation of possible remains of the ark has only shown natural sedimentary formations. Flood geology is the religiously-inspired interpretation of the geological history of the Earth in terms of the global flood described in Genesis 6–9. Similar views played a part in the early development of the science of geology, even after the biblical chronology had been rejected by geologists in favour of an ancient Earth. Flood geology is an activity within creation science, which is a part of young Earth creationism. Modern geology and its sub-disciplines utilize the scientific method to analyze the geology of the earth. Flood geology contradicts the scientific consensus in geology and paleontology, as well as that in related disciplines such as chemistry, physics, astronomy, cosmology, biology, geophysics and stratigraphy. There is an absence of evidence for any of the effects proposed by flood geologists, and their claims concerning phenomena such as fossil layering are not taken seriously by scientists. More generally, the key tenets of flood geology are refuted by scientific analysis, and it is considered to be pseudoscience within the scientific community. Author JJ Dyken notes that established civilizations in Egypt and China were not impacted by claims of a global flood during the time of Noah's Ark. Wikisource has the text of a 1905 New International Encyclopedia article about Noah's Ark. ↑ "In the six hundredth year of Noah’s life, on the seventeenth day of the second month the flood began." Genesis 7:11; "The water receded steadily from the earth. At the end of the hundred and fifty days the water had gone down, and on the seventeenth day of the seventh month the ark came to rest on the mountains of Ararat. The waters continued to recede until the tenth month, and on the first day of the tenth month the tops of the mountains became visible." Genesis 8:3-5; The 17th day of the 7th month - the 17 day of the 2nd month = 5 months @ 30 days / month = 150 days. ↑ Bandstra 2008, pp. 61, 62. 1 2 Mayell, Hillary (27 April 2004). "Noah's Ark Found? Turkey Expedition Planned for Summer". National Geographic Society. Retrieved 29 April 2010. 1 2 Fagan, Brian M.; Beck, Charlotte (1996). The Oxford Companion to Archaeology. Oxford: Oxford University Press. ISBN 0195076184. Retrieved 17 January 2014. 1 2 Cline, Eric H. (2009). Biblical Archaeology: A Very Short Introduction. Oxford: Oxford University Press. ISBN 0199741077. Retrieved 17 January 2014. 1 2 Feder, Kenneth L. (2010). Encyclopedia of Dubious Archaeology: From Atlantis to the Walam Olum. Santa Barbara, California: ABC-CLIO. ISBN 031337919X. Retrieved 17 January 2014. ↑ Isaak 1998; Young 1995; Isaak 2006; Morton 2001; Isaak 2007, p. 173; Stewart 2010, p. 123; Schadewald 1982, pp. 12–17; Scott 2003. 1 2 Moore, Robert A. (1983). "The Impossible Voyage of Noah's Ark". Creation Evolution Journal. 4 (1): 1–43. ↑ Levenson, Jon D. (2004). "Genesis: introduction and annotations". In Berlin, Adele; Brettler, Marc Zvi. The Jewish Study Bible. Oxford University Press. ISBN 9780195297515. ↑ Hamilton 1990, pp. 280–282. 1 2 Gooder 2005, p. 38. 1 2 Knight 1990, pp. 175–176. ↑ Kessler & Deurloo 2004, p. 81. ↑ Enns 2012, p. 23. ↑ Kvanvig 2011, p. 210. ↑ Chen 2013, p. 3-4. ↑ Chen 2013, p. 253. ↑ Finkel 2014, p. 89-101. 1 2 Nigosian 2004, p. 40. ↑ Hamilton 1990, p. 282. ↑ McKeown 2008, p. 55. ↑ May, Herbert G., and Bruce M. Metzger. The New Oxford Annotated Bible with the Apocrypha. 1977. ↑ Stephanie Dalley, ed., Myths from Mesopotamia: Creation, The Flood, Gilgamesh, and Others, pp. 5–8. ↑ Alan Dundes, ed., The Flood Myth, pp. 61–71. ↑ J. David Pleins, When the Great Abyss Opened: Classic and Contemporary Readings of Noah's Flood, pp. 102–103. ↑ Avigdor Nebenzahl, Tiku Bachodesh Shofer: Thoughts for Rosh Hashanah, Feldheim Publishers, 1997, p. 208. 1 2 McCurdy, J. F.; Bacher, W.; Seligsohn, M.; et al., eds. (2002). "Noah". Jewish Encyclopedia. JewishEncyclopedia.com. 1 2 McCurdy, J. F.; Jastrow, M. W.; Ginzberg, L.; et al., eds. (2002). "Ark of Noah". Jewish Encyclopedia. JewishEncyclopedia.com. ↑ Hirsch, E. G.; Muss-Arnolt, W.; Hirschfeld, H., eds. (2002). "The Flood". Jewish Encyclopedia. JewishEncyclopedia.com. ↑ Ibn Ezra's Commentary to Genesis 7:16. HebrewBooks.org. ↑ Cohn 1999, p. 38. ↑ St. Augustin (1890) [c. 400]. "Chapter 26:That the ark Which Noah Was Ordered to Make Figures In Every Respect Christ and the Church". In Schaff, Philip. Nicene and Post-Nicene Fathers [St. Augustin's City of God and Christian Doctrine]. 1. 2. The Christian Literature Publishing Company. ↑ Jerome (1892) [c. 347–420]. "Letter LXIX. To Oceanus.". In Schaff, P. Niocene and Post-Niocene Fathers: The Principal Works of St. Jerome. 2. 6. The Christian Literature Publishing Company. ↑ Baring-Gould, Sabine (1884). "Noah". Legends of the Patriarchs and Prophets and Other Old Testament Characters from Various Sources. James B. Millar and Co., New York. p. 113. ↑ Poirier, Brent. "The Kitab-i-Iqan: The key to unsealing the mysteries of the Holy Bible". Retrieved 25 June 2007. ↑ Shoghi Effendi (1971). Messages to the Bahá'í World, 1950–1957. Wilmette, Illinois, USA: Bahá'í Publishing Trust. p. 104. ISBN 0-87743-036-5. ↑ Collins, Lorence G. (2011). "A supposed cast of Noah's ark in eastern Turkey" (PDF). ↑ Parkinson 2004, pp. 24–27; Numbers 2006, p. 10. ↑ Evans 2009 Proponents were first known as flood geologists, but renamed themselves as "scientific creationists" or "young-earth creationists" in the early 1970s. 1 2 Young 1995; Isaak 2006; Morton 2001; Isaak 2007, p. 173; Stewart 2010, p. 123. ↑ Montgomery, David R. (2012). The Rocks Don't Lie: A Geologist Investigates Noah's Flood. Norton. ISBN 9780393082395. ↑ Schadewald 1982, pp. 12–17; Scott 2003. ↑ Dyken, JJ (2013). The Divine Default. Algora Publishing. Hamilton, Victor P. (1990). The book of Genesis: chapters 1–17. Eerdmans. ISBN 9780802825216. Knight, Douglas A. (1990). "Cosmology". In Watson E. Mills (General Editor). Mercer Dictionary of the Bible. Macon, Georgia: Mercer University Press. ISBN 0-86554-402-6. McKeown, James (2008). Genesis. Two Horizons Old Testament Commentary. Wm. B. Eerdmans Publishing Company. p. 398. ISBN 0-8028-2705-5. Isaak, Mark (2007). "Creationist claim CD750". The Counter Creationism Handbook. Berkeley and Los Angeles, California: University of California Press. p. 330. ISBN 978-0-520-24926-4. Numbers, Ronald L. (2006). The Creationists: From Scientific Creationism to Intelligent Design, Expanded Edition. Harvard University Press. p. 624. ISBN 0-674-02339-0. Stewart, Melville Y. (2010). Science and religion in dialogue. Malden, MA: Wiley-Blackwell. p. 123. ISBN 1-4051-8921-5. Young, Davis A. (1995). The Biblical Flood: a case study of the Church's response to extrabiblical evidence. Grand Rapids, Mich: Eerdmans. p. 340. ISBN 0-8028-0719-4. Retrieved 16 September 2008. Young, Davis A.; Stearley, Ralph F. (2008). The Bible, rocks, and time : geological evidence for the age of the earth. Downers Grove, Ill.: IVP Academic. ISBN 978-0-8308-2876-0. Parkinson, William (January–February 2004). "Questioning 'Flood Geology': Decisive New Evidence to End an Old Debate". NCSE Reports. National Center for Science Education. 24 (1). Retrieved 2 November 2010. Schadewald, Robert J. (Summer 1982). "Six Flood Arguments Creationists Can't Answer". Creation/Evolution Journal. National Center for Science Education. 3 (3): 12–17. Retrieved 16 November 2010. Schadewald, Robert (1986). "Scientific Creationism and Error". Creation/Evolution. 6 (1): 1–9. Retrieved 29 March 2007. Evans, Gwen (3 February 2009). "Reason or faith? Darwin expert reflects". UW-Madison News. University of Wisconsin-Madison. Retrieved 18 June 2010. Isaak, Mark (5 November 2006). "Index to Creationist Claims, Geology". TalkOrigins Archive. Retrieved 2 November 2010. Sacks, Robert D. (1990). A Commentary on the Book of Genesis. Edwin Mellen. Wenham, Gordon (2003). "Genesis". In James D. G. Dunn; John William Rogerson. Eerdmans Bible Commentary. Eerdmans. ISBN 9780802837110. Whybray, R. N. (2001). "Genesis". In John Barton. Oxford Bible Commentary. Oxford University Press. ISBN 9780198755005. Batto, Bernard Frank (1992). Slaying the Dragon: Mythmaking in the Biblical Tradition. Westminster John Knox Press. ISBN 9780664253530. Browne, Janet (1983). The Secular Ark: Studies in the History of Biogeography. New Haven & London: Yale University Press. p. 276. ISBN 0-300-02460-6. Campbell, Antony F.; O'Brien, Mark A. (1993). Sources of the Pentateuch: texts, introductions, annotations. Fortress Press. ISBN 9781451413670. Campbell, A. F.; O'Brien, M. A. (1993). Sources of the Pentateuch: Texts, Introductions, Annotations. Fortress Press. ISBN 9781451413670. Carr, David M. (1996). Reading the fractures of Genesis. Westminster John Knox Press. ISBN 9780664220716. Clines, David A. (1997). The theme of the Pentateuch. Sheffield Academic Press. ISBN 9780567431967. Davies, G. I. (1998). "Introduction to the Pentateuch". In John Barton. Oxford Bible Commentary. Oxford University Press. ISBN 9780198755005. Levin, Christoph L. (2005). The Old testament: a brief introduction. Princeton University Press. ISBN 0691113947. Levin, C. (2005). The Old Testament: A Brief Introduction. Princeton University Press. ISBN 9780691113944. Compilation (1983). Hornby, Helen, ed. Lights of Guidance: A Bahá'í Reference File. Bahá'í Publishing Trust, New Delhi, India. ISBN 81-85091-46-3. Emerton, J. A. (1988). Joosten, J., ed. "An Examination of Some Attempts to Defend the Unity of the Flood Narrative in Genesis: Part II". Vetus Testamentum. International Organization for the Study of the Old Testament. XXXVIII (1). Nicholson, Ernest W. (2003). The Pentateuch in the twentieth century: the legacy of Julius Wellhausen. Oxford University Press. ISBN 9780199257836. Plimer, Ian (1994). Telling Lies for God: Reason vs Creationism. Random House Australia. p. 303. ISBN 0-09-182852-X. Speiser, E. A. (1964). Genesis. The Anchor Bible. Doubleday. ISBN 0-385-00854-6. Wenham, Gordon (1994). "The Coherence of the Flood Narrative". In Hess, Richard S.; Tsumura, David Toshio. I studied inscriptions from before the flood (Google Books)|format= requires |url= (help). Sources for Biblical and Theological Study. 4. Eisenbrauns. p. 480. ISBN 0-931464-88-9. Young, Davis A. (March 1995). The Biblical Flood: A Case Study of the Church's Response to Extrabiblical Evidence. Grand Rapids, MI: Eerdmans Pub Co. p. 340. ISBN 0-8028-0719-4. Douglas, J. D.; Tenney, Merrill C., eds. (2011). Zondervan Illustrated Bible Dictionary. revised by Moisés Silva (Revised ed.). Grand Rapids, Mich.: Zondervan. ISBN 0310229839.